Bermuda Institute of Ocean Sciences researchers Andreas Andersson and Nicholas Bates were part of a groundbreaking US National Science Foundation study on how increasing acidity in the sea’s waters may fundamentally change how nitrogen is cycled in them (a water sample being taken in the Sargasso Sea north-east of Bermuda during the course of the study is shown at left). Their findings appear in this week’s issue of the journal “Proceedings of the National Academy of Sciences.” Nitrogen is one of the most important nutrients in the oceans. All organisms, from tiny microbes to blue whales, use nitrogen to make proteins and other important compounds. “Ocean acidification will have widespread effects on marine ecosystems, but most of those effects are still unknown,” says David Garrison, director of the National Science Foundation (NSF)’s Biological Oceanography Programme, which funded the research along with NSF’s Chemical Oceanography Programme. Very little is known about how ocean acidification may affect critical microbial groups like the ammonia oxidizers, “key players in the ocean’s nitrogen cycle,” says Michael Beman of the University of Hawaii and lead author of the PNAS paper. 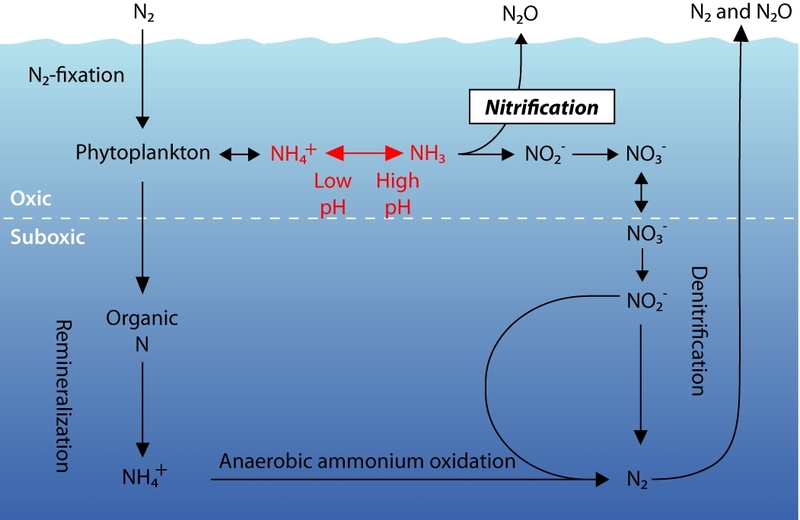 In six experiments spread across two oceans, Mr. Beman and colleagues including BIOS’ Mr. Andersson and Mr. Bates, looked at the response of ammonia oxidation rates to ocean acidification. These declines were remarkably similar in different regions of the ocean indicating that nitrification rates may decrease globally as the oceans acidify in coming decades, says David Hutchins of the University of Southern California, a co-author of the paper. Oceanic emissions of nitrous oxide are second only to soils as a global source of nitrous oxide. With a pH decrease of 0.1 in ocean waters (making the waters more acidic), the scientists estimate a decrease in nitrous oxide emissions comparable to all current nitrous oxide emissions from fossil fuel combustion and industrial activity. 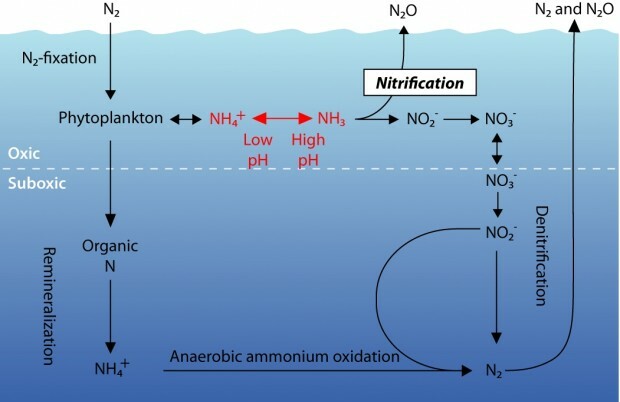 An important caveat, they say, is that nitrous oxide emissions from oceanic nitrification may be altered by other forms of global environmental change such as increased deposition of nitrogen to the ocean, or loss of oxygen in some key areas. 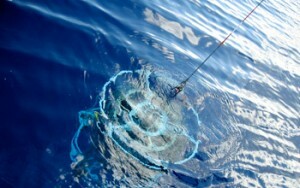 “That could offset any decrease due to ocean acidification, and needs to be studied in more detail,” says Mr. Hutchins. Another major implication of the findings is equally complex, the researchers say, but just as important. As human-derived carbon dioxide permeates the sea, ammonia-oxidizing organisms will be at a significant disadvantage in competing for ammonia. Over time, that would shift the available form of dissolved nitrogen in the surface oceans away from forms like nitrate that are produced by nitrification, and toward regenerated ammonium. With a decrease in average ocean pH from 8.1 to 8.0 (greater acidity), the scientists estimate that up to 25 percent of the ocean’s primary production could shift from nitrate- to ammonium-supported. The consequences of such a shift are not easily predicted, says Hutchins, but would likely favor certain drifting, microscopic plant species over others, with cascading effects throughout marine food webs. Other co-authors of the reportr are: Cheryl-Emiliane Chow, Andrew King, Yuanyuan Feng and Jed Fuhrman of the University of Southern California and Brian Popp of the University of Hawaii.